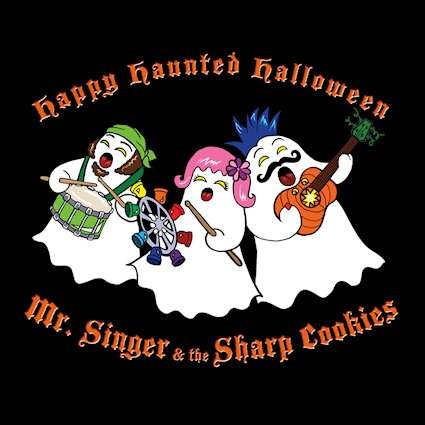 A RUP LIFE: HAPPY HAUNTED HALLOWEEN BY MR. SINGER & THE SHARP COOKIES CD Review & Giveaway! HAPPY HAUNTED HALLOWEEN BY MR. SINGER & THE SHARP COOKIES CD Review & Giveaway! In our prep for Halloween we like to make a playlist of tunes to play when the trick-or-treators come knocking. I like to keep it fun with some classics like Monster Mash, Thriller and The One-eyed Giant Purple People Eater while adding new songs to the mix. We received Happy Haunted Halloween by Mr. Singer & The Sharp Cookies to review I knew we'd be adding new songs to the night's activities. This cd has a good mix of different styles of music all with that spooky feel. The opening song Happy Halloween is light and catchy. Then we jump into a darker rock song with Gonna Get Me Monster. How Many Pieces of Candy is a folk number that will have you wanting to get your maracas out and sing along. I love how this album jumps around genres but all have that overlay of spooky sounds and lyrics. It is eclectic but it works and it is fun! Perfect for setting the mood for Halloween! Chicago's most energetic band that rocks for kids, the award-winning Mr. Singer & the Sharp Cookies, goes all out for the season of ghosts and goblins with their fourth album, Happy Haunted Halloween, set for release on October 5, 2018. With plenty of treats and maybe a few tricks up its sleeve, Happy Haunted Halloween offers something for everyone who loves Halloween: spooky songs about haunted houses, ghost towns, crawl spaces, and monster hunters; sweet songs about gathering with friends, dressing up as a cuddly bunny, and counting trick or treat loot; and even an historical song about the brilliant teenage author, Mary Shelley, plus a dance number inspired by her novel Frankenstein. Home Many Pieces Of Candy? Happy Haunted Halloween will be available at all digital retailers, including iTunes, Amazon, Google Play, CDBaby, and more. The Album Releases October 5, 2018! Visit the Mr. Singer & the Sharp Cookies website HERE. Mr. Singer & the Sharp Cookies on Facebook. One lucky reader will win a copy of Happy Haunted Halloween!